Bolair offers custom two component dispense systems utilizing Graco quality products. Whether the application calls for precise metering of small shots or continuous high volume flow, Bolair can provide the equipment required. If you have a material to apply Bolair will dispense it with accuracy. 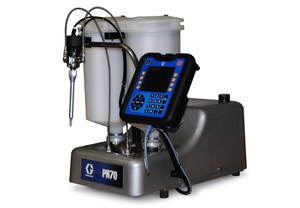 GRACO PR70 - The best choice for precise meter/mix and dispense applications in a benchtop design! Graco positive displacement metering expertise in a compact, modular design to support a broad range of industries and applications. The Graco PR70 fixed and variable ratio systems accurately meter, mix and dispense medium-to-low viscosity materials for bonding, sealing, potting, gasketing, encapsulation and syringe filling. Standard features include: electric controls, digital shot entry, gel timer, purge, and preventative maintenance counters. "Recently, my company has chosen these equipment solutions. We are happy with the excellent quality of the products and the considerate behavior of Bolair Fluid Handling Systems' employees. Bravo!"